This year, I decided to take the advice of Martha (Stewart, that is). Appearing on one of the morning news programs, she was giving advice to a woman who brought her Crown of Thorns plant with her for help. The woman's plant resembled mine...multiple stalks, rather spindly, tall and leggy with little growth along the stalks...yet all healthy. Watching Martha remove the potted plant from it's pot, I cringed and then saw the look of concern on the audience member's face as Martha cut off all the crowns and discarded the tall, leggy, thorny stems. The woman looked mortified and to tell you the truth. I was too as I watched and listened. So this past Spring, when the Pres was ailing and I was given the opportunity and time, I took my plant out on the deck and began dissecting it. Martha had told the audience that you can root just about anything in sand as long as you keep it moist. Well, Martha was right! Wearing my heavy leather rose gloves, the five crowns I cut off were placed in a four inch deep pot of sand and placed in an Eastern window. They were watered regularly. Days...weeks passed. Finally it was time for me to transplant them. 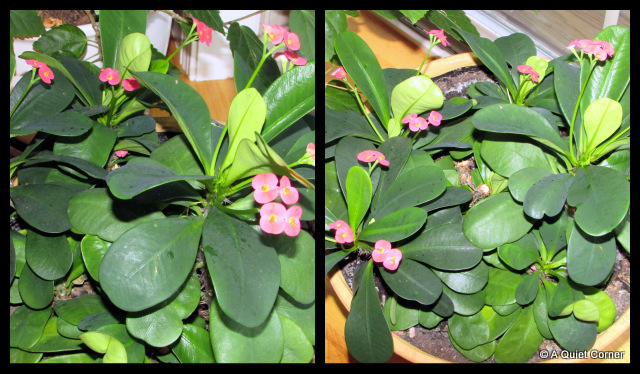 Look at my Crown of Thorns now...:). Full and compact, the pot is in front of my slider which gets Southern exposure and, like my other houseplants, gets watered weekly. I do have a question for all you plant people out there though. Do you think I should "pinch" the tops occasionally like I do with perennials? Good morning, they are lovely plants. The flowers are cute. I wish I had a green thumb. Happy Monday, enjoy your new week ahead! Good for you!! What beautiful plants, and the key for me is remembering to water any little cuttings. :-) I'm not familiar with that plant. Think I'll track down one next spring. It's very pretty and not at all what I expected given the name. Oh how lovely to have it all turn out right! It's a good thing indeed. Enjoyed your story today, thanks for sharing.